On the other hand I have had the ability to directly handle a great number of modern blooms, perhaps as many as one hundred. For at least 3/4 of those, I was present or directly involved in the physical process that created them. So its safe to say I have some insight into how the final condition of a specific bloom relates to its actual production. I would consider it quite unusual for a completed bloom to have remained to be deposited and discovered by modern day archaeologists in the first place! The process of creating an iron bloom involves a considerable expenditure of resources, time and effort on the part of those ancient workers. 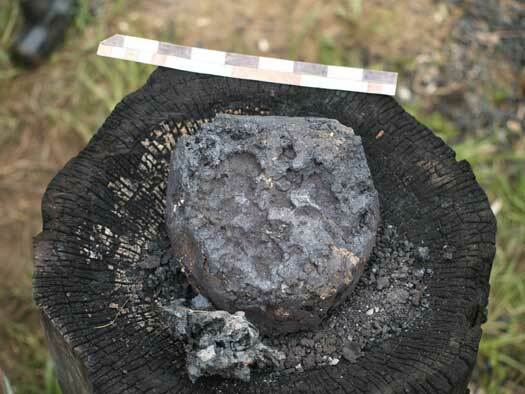 First, wood needs to be harvested, cut, baked to charcoal, then the charcoal correctly sized. Ore needs to be gathered, roasted and sized. Clay and other materials need to be gathered, prepared, mixed and a furnace built. Running the smelter itself is a day long process, with considerable extra labour required to operate the bellows continually. Once the bloom is in hand that large mass needs to be repeatedly heated and hammered to compress it into its final shape. All this effort means a finished iron bloom had considerable value, never to be casually tossed aside. From a private letter by Arne Espelund (which provoked this article). and has taken on the classic compressed puck shape. Another significant change was in density, calculated at 7.7 grams/cc. This compares with Vinland 2 (seen below), which was not hammer worked, and has a density of 5.5 grams/cc. 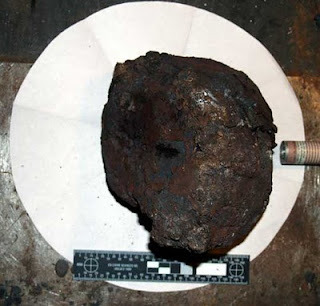 (4) Now the puck is not the shape of the developing bloom inside these smelting furnaces. (5) The initial shape of the bloom, as it is extracted, is (understandably) the product of the environment in which it forms. 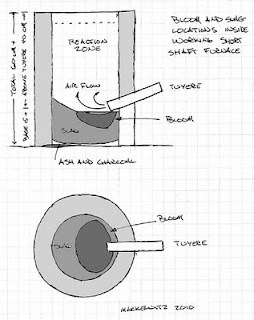 A simplified diagram of the shape and position of an iron bloom inside a short shaft furnace. To provide a simple analogy, the natural bloom produced inside a this type of smelter (with high air volume) is a 'flattened football' shape. The hotest spot in the furnace is located just beyond and just above the tip of the tuyere. As slag forms, it runs downwards, congealing as it cools at the bottom of the furnace. Depending on the exact size and shape of the furnace, how much slag is produced, just how hot the furnace has been running and for how long; will all combine to determine the shape of the bottom of the slag mass. The top layer of the slag mass, closest to the hot spot, will remain as a liquid. In this idealized furnace, the tuyere directs the air blast slightly downwards, but heat and charcoal creates a swirl curving upwards, and actually back towards the front wall. This shapes the upper portion of the slag mass to a tilted, shallow bowl, higher at the rear of the furnace than at the tuyere. In an operating furnace, it is inside the pool of liquid slag that the iron bloom develops, starting to form at a point just below the tip of the tuyere. The bloom itself starts small and lacy and slowly increases in both size and density as the reduced iron accumulates. (So one caution is that larger blooms will display a different shape than smaller ones. ) As the front edge of the bloom tends to hug close to the furnace wall at the tuyere, the bloom will take on the curvature of the inner surface. As the core temperature is driven by the air blast, the opposite side of the bloom is generally a curve that forms as some radius from the tip of the tuyere. This means the bloom often forms twice as wide as it is deep, especially noticeable with mid sized blooms. Truly large blooms can grow to fill the entire slag bowl / furnace bottom area. In cross section, the bloom is often thicker at the front of the furnace, again just below the tuyere. The thickness will taper off towards the rear. This results in a kind of table spoon shaped cross section, with a steeper angle to the front and more of a gradual slope to the rear. The air blast is of course aimed directly at the top of the slag bath and developing bloom. This generally results in the upper surface being more or less flat, but often with a shallow depression where the force of the air blast hits it. Too steep an angle, and the air blast functions like a cutting torch, slicing into the bloom itself. Blooms with a distinctive lobed shape on the top surface have been seen as the result. Top View : The curvature of the bloom echoing the inner furnace wall can be clearly seen. The shallow depression in the upper surface was caused by the air blast working directly on the iron's surface. 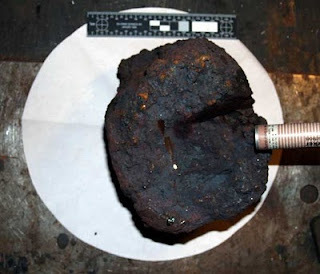 Side View : Although not quite the classic 'spoon' cross section, this was a fairly large bloom for the small size of smelter that created it. The bloom would have sat higher up inside a slag bowl, and the tuyere would have sat somewhat higher above the mass than is indicated here. Bottom : Showing to a certain extent, the difference in texture between the bloom's bottom and the upper surface view.  The bloom used in the illustrations above is Vinland 2, produced by the DARC team in October 2009. The paper circle represents the approximate internal diameter of the smelter used to produce this bloom (25 cm). The rough position of the tuyere is marked by the thick marker. This bloom weighs 5.6 kg, and represents a 27% return from the ore used in the smelt. It was hammer worked only for the initial heat available after extraction. This means that although the surface has been slightly compressed, it still has not been fully consolidated, as the cracking visible on the bottom surface indicates. There was a single short attempt made to slice the bloom on the upper surface, but this effort was aborted before much depth had been achieved (Primarily because the bloom had cooled too much to make further working impractical) . Of course, no situation in reality is likely to duplicate any theoretical ideal! The working dynamics inside an individual smelter are just too complex. Regardless of how the illustrated bloom may not fit the ideal pattern, it is certainly clear that this bloom is not the flattened puck shape seen in many artifact blooms. 2) Arne Espelund, "Blooms / Darrell 0210" Feburary 8, 2010 Private e-mail message to the author. 4) Both blooms are the products of quite similar furnaces, inside the same experimental series. 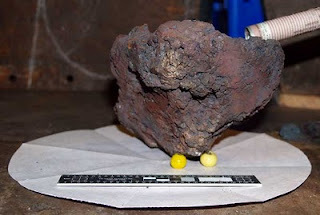 Both used similar content ore analogs, with Vinland 1 from 18 kg ore and Vinland 2 from 20.7 kg.